The Portland housing market is tight. Increased demand, with higher household formation and population growth, coupled with limited supply currently on the market are driving prices higher for both ownership and rental units. The median price of homes sold in the metropolitan area is effectively back to housing boom peak numbers, per RMLS. The rental vacancy rate is among the lowest in the country and prices are at an all-time high. The housing bubble, obviously, had a tremendous impact on the market and the bust has been disproportionate to the boom. While new construction has picked up in recent years, it has yet to fully regain the lost ground during the downturn, relative to underlying population growth. The good news is as housing supply continues to increase, eventually it should put downward pressure on prices, raising affordability. In a 4 post series focusing primarily on the Portland Metro, our office’s new housing work covers the bubble’s impact on ownership by year and by neighborhood today. On Friday, Part 2 covers underlying trends in construction and demographics. Part 3 will go over housing affordability in Portland, while Part 4 will provide an outlook. Some economists point to the swings in home prices as the defining feature of the housing bubble era, and with good reason. However I would argue that it’s more than just the price swings, but how they actually impacted the pattern of homeownership is more important and I don’t mean the overall homeownership rate. 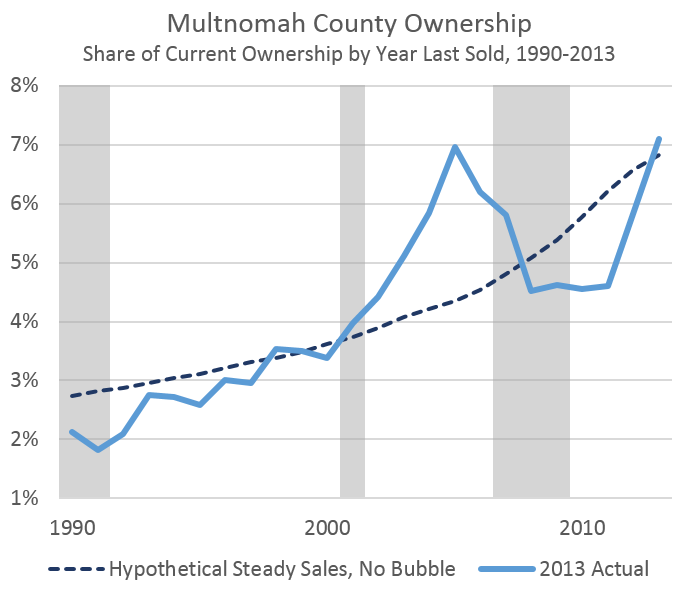 As shown below, the share of homes in Multnomah County last sold during the boom is disproportionately high relative to what one would have expected ahead of time, if sales had been relatively steady each year. Some owners sell their homes after 5 years, or 8 years, with the median homeowner being in the same home 15 years. Using these ownership duration figures, based on work from the National Home Builders Association, one is able to construct what a typical ownership pattern would or should look like. That’s the dashed, dark blue line below. 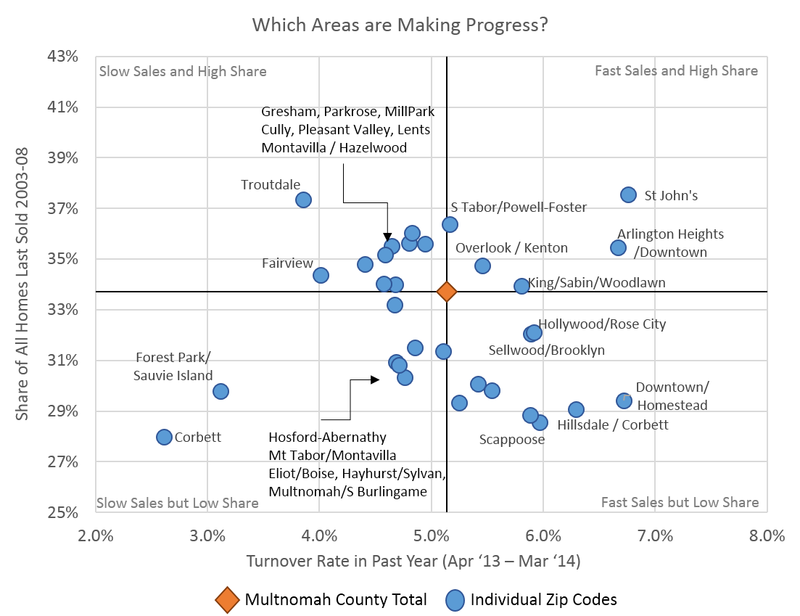 In actuality, ownership patterns in Multnomah County are in the solid, light blue line. The differences here are immense. It works out to 1/3 more homes last sold during 2003-2007 and still owner-occupied, or at least not resold, then if the sales pattern had been more stable. So it is not just the price swings themselves, but the fact that more households bought during the boom and have yet to resell or move. Some by choice, some by necessity or being underwater. In fact, while most areas within the Portland MSA have seen strong price appreciation in recent years, nearly back to peak levels, only about 20 percent of individual zip codes are actually all the way back, per data from Zillow. The price swings have a big impact on the incentive on when/if current homeowners sell. This overall pattern has big implications for the housing market in terms of existing homes for sale, neighborhood effects and remodel work, among others. In terms of the existing stock of homes, which types are most impacted by the housing bubble? Examining the current value of each home in Multnomah County reveals that those homes last sold during the boom and have yet to be sold again, are disproportionately in the starter home ($150,000 – $250,000) and McMansion ($450,000 – $600,000) price range. This makes intuitive sense as well. During the boom, there was strong competition for each type of home, with many households trying (and succeeding, at least at first, based on the lack of underwriting standards) to obtain their own piece of the American Dream. Homes in the lower price tier experienced the largest boom and bust pattern based on S&P/Case-Shiller home price data, which reflects the strong demand and competition for entry level homes, even by those who traditionally may have been unable to afford or meet underwriting standards. McMansions also experienced strong demand as middle income families sought to move up into a higher priced home, and many higher-end subdivisions or communities were built throughout the region in these price ranges. Besides prices and types of homes, the bubble’s impact on ownership has had disproportionate impacts on neighborhoods and geographic regions within the Portland Metro. As discussed previously, the graph below shows the share of homes in each neighborhood that last sold during the boom on the vertical axis and the pace of home sales on the horizontal axis. Here one can see which neighborhoods have a relatively large share of these bubble era home sales, and also which ones are currently seeing sales either above or below average pace. Many of Portland’s close-in neighborhoods, where recent demand has been strongest, have seen strong sales in the past year or two and/or have a lower share of homes last sold during the bubble. Many of the outlying regions are seeing the opposite pattern. As demand continues to be strong in both the central city and in town centers across the region, the pattern makes sense. The hardest hit suburbs and exurbs are generally the last to share in the housing recovery, if at all yet. Another way the bubble’s impact on ownership works through the housing market is remodeling. If an owner remains in the home for a longer period of time than they may have expected when they bought, they turn to making the best of the situation. If one cannot move, maybe by choice (the owners do not see another/better option in their desired neighborhood) or by necessity (underwater), they concentrate on improving the existing home the best they can, or afford. In other words, instead of upgrading their homes via moving up into a better one (see: expensive), owners upgrade the quality of the existing housing stock. 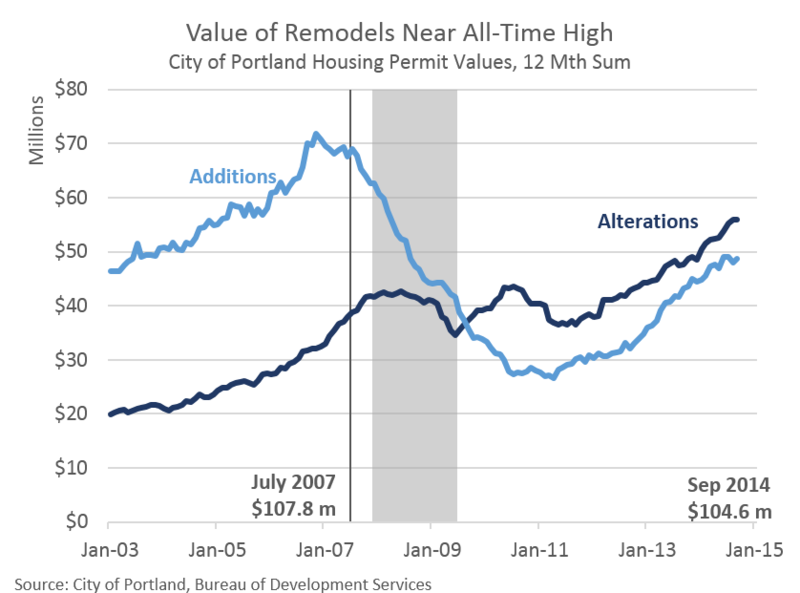 Examining housing permit data from the City of Portland reveals that projects that can broadly be considered remodel work, are nearly all the way back to peak levels, at least in nominal dollar terms. New home construction is about half-way back, but remodeling has been much stronger. At the national level, the NAHB Remodel Index is at an all-time high and in terms of U.S. GDP, home improvements have been larger than actual new construction for much of the economic expansion. On Friday, Part 2 will cover underlying trends in construction and demographics. Part 3 goes over housing affordability and Part 4 provides an outlook. Below are the full set of slides from our office’s housing work, including both upcoming material and many additional graphs and figures.